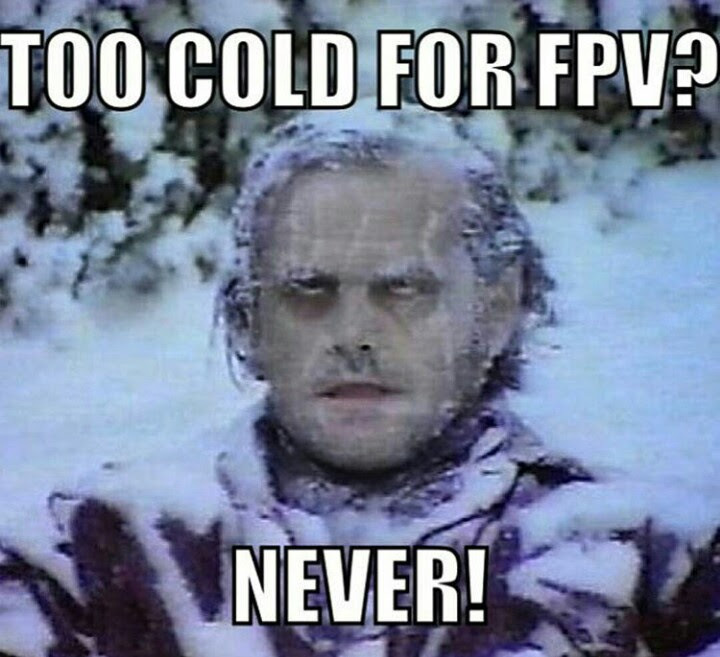 As its getting colder here in the northern hemisphere, and the nights are much longer its getting a bit harder to get your daily dose of FPV after work! So the one option is to attach a new night FPV camera to your quad like the runcam eagle owl, but that still involves freezing your fingers, and if its raining then I guess you are stuck. Fortunately there are plenty of brushed nano FPV quadcopters turning up all over the place allowing you to fly FPV just about anywhere. In this article I have looked at a bunch of them and suggest the best ones you should consider! Before we get into the list, here are a few things that you want to consider when looking for a new indoor microquad. Smaller than 110mm – if the motor to motor dimension is bigger than 110mm then its no longer a micro quad. 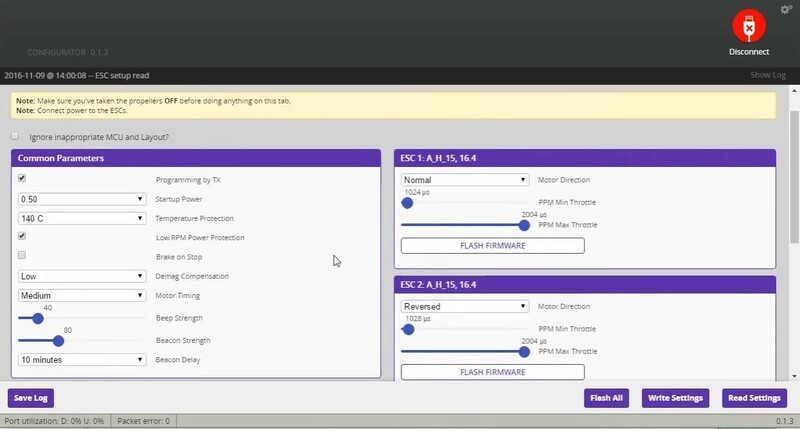 Cleanflight/Betaflight based flight controller – the cleanflight/betaflight firmware is the best for FPV quadcopters, and is easy to update and configure. Read to fly – should be ready to fly, bind and fly, or almost ready to fly (just add your own receiver) as we are not looking at DIY build kits in this article. 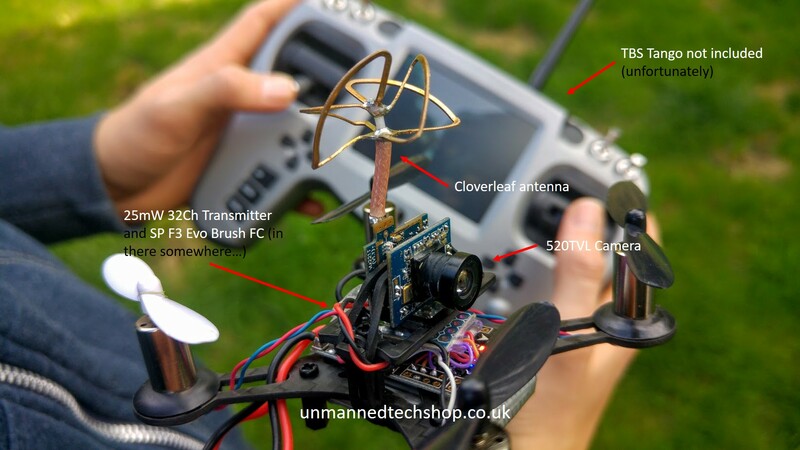 5.8Ghz FPV transmitter (no wifi stuff) – there are a few small quadcopters that have built in WIFI FPV, but that’s not good enough for FPV flying due to latency. How tough is it, and how easy is it to repair? – Its going to crash, so how robust is the construction, and if something does break how easy/expensive is it to repair? What motors does it use? – In order to have decent flight performance you need to have powerful motors, but the more powerful the motors the less flight time you have. With brushed motors the bigger the diameter, the more powerful the motors are! Most decent setups use 8520 size brushed motors. With that settled, lets bring on the micro quads! The QX90 is a bind and fly quadcopter, is uses a F3 based flight controller, and has an all in one FPV camera and transmitter. Included with the QX90 is one of 3 receivers, compatible with either FRsky, Spektrum, and FlySky (frsky receiver is only compatible with international firmware and not the EU LBT firmware). Driving this quad are some 8.5x20mm motors which produce impressive power making this quad powerful enough to fly outdoors in the wind! The kit also includes two batteries which is great to get more flying done per session. 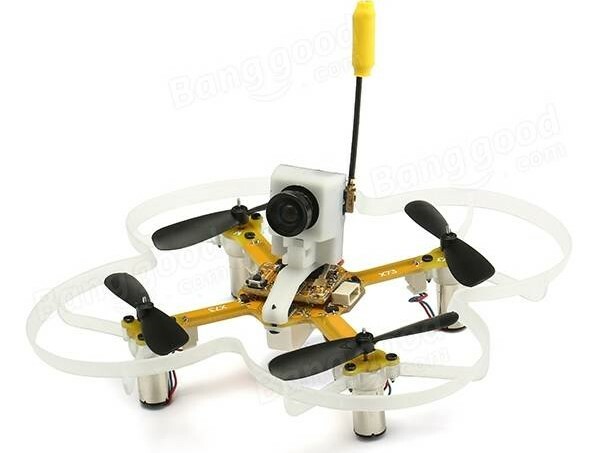 The frame itself is made from a single piece of carbon fiber so the frame itself is very strong, however the main weakness is the FPV antenna which takes most of the abuse when you crash upside down. However there is an optional FPV antenna protector for it that you can buy. At around £60 / $69.99 the QX90 offers alot of fun for indoor and even outdoor FPV flying. This is currently my favorite goto micro FPV quadcopter. If you do manage to break something the frame itself is very simple. The motors simply slide into the rubber gaskets, props clip in. The motors need to be re-soldered onto the flight controller (make sure to check polarity). The camera itself is only held on with elastic bands, so it comes undone when you crash to help protect it. Over time I think the FPV antenna will probably snap off, but it should be easy enough to re-solder it. With the kit you get 2x spare motors, and a bunch of spare props. Also if you want something even more maneuverable, but at the price of a weaker plastic frame, there is also a QX90c version which uses the same gear, but is abit lighter and more agile. So if you hardly crash this might be a better option for you. This is a newly released quadcopter which is copied from the inductrix, however despite this I think they did a better job as it includes more powerful motors and has propper FPV gear, plus its nice and cheap (more on inductrix later in this article). Specs wise, it uses similar equipment to the QX90, with a cleanflight SP F3 flight controller, a naked version of the EF 01 FPV camera/VTX combo. The QX70 uses a 4 blade ducted fan design to produce more thrust, this also has the added benefit of protection the propellers. Again the FPV antenna is left rather exposed so that is likely to be the first thing to break! You have the choice of 3 receivers with this quadcopter, depending on your radio gear be it Frsky, Flysky or Spectrum, however the frsky receiver is only compatible with international firmware and not the EU LBT firmware. I am yet to get my hands on one, but we have some on the way so stay tuned to this blog in the future for my review, but since it shares some components with the QX90 I am confident this quad will be great. We will post a full review within a few weeks! If you are looking for something a little bigger and only use spektrum R/C gear, then the fire 104 is a great option. Because the frame is abit bigger it means that the FPV gear is better protected (and it looks abit cooler). Also you can upgrade the motors to use bigger props if you need more power. However despite the bigger size, the weight of the Fire 104 is still very low at just 37g (without battery). 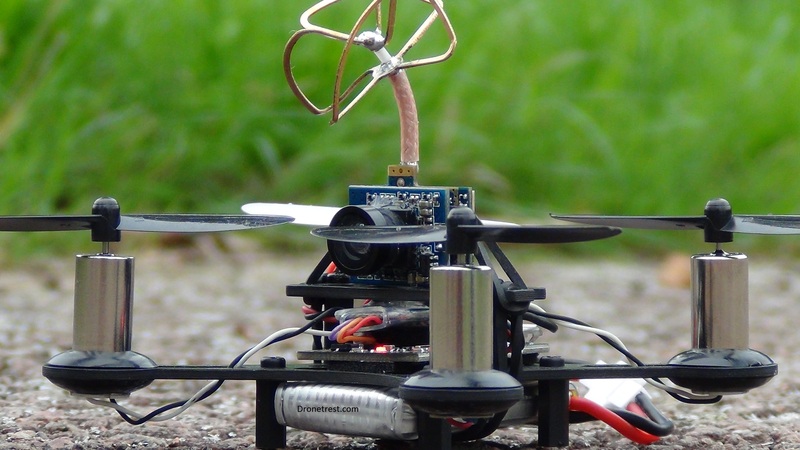 Powering this quad is the Micro Scisky 32bits Brushed Flight Control, while old is still fully capable. It uses an older F1 chip (which is pleanty good enough for micro quadcopters), and the best thing is that it has a built in Spektrum DSM2 receiver, which is why the fire 104 is so light. The only downside is that the FPV transmitter is only 16CH and it only uses a linear antenna which is not quite as good as the circular polarized antennas on the QX90 and QX70. But the camera does have a higher TVL resolution, but with a cheap antenna this will not be very noticeable, especially when you start to fly further away so that is something you will want to upgrade, although it will require some soldering. Overall the fire 104 is a great quad, but considerable more expensive than the QX90, QX70 at about £97 ($119), but if you want something that keeps your FPV gear safe, use DSM2 R/C and want slightly longer flight times then this is the best one for you. No list of micro FPV quadcopers would be complete without the mention of the Blade Inductrix, also known as the tiny whoop. This micro quadcopter is what started the entire micro FPV quadcopter craze, it was a small with very power motors which made it possible to attach your own FPV gear, now you can even buy a replacement FC for the blade inductrix to run cleanflight. However now blade have released an all in one FPV version of the inductrix which is very nice! 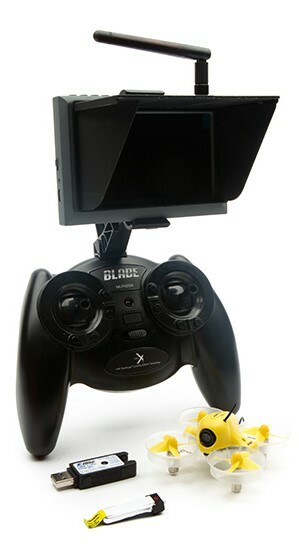 Although I mentioned at the top of this article that it was a requirement for the flight controller to run cleanflight/betaflight, however blade make decent products (albeit abit expensive) so I have made the exception for this as its a great total beginner kit to get into FPV the easy way as you have the option to buy it as a fully ready to fly kit with an FPV monitor. This quad is best if you are looking for a complete all in one package ready to go out of the box. Its made by a top quality brand that you can trust. However the only issue for me is that when you get addicted to FPV (and you will!) you will want to upgrade, but since blade uses all proprietary gear, you will probably not get to use much of the gear you get with this quad on future builds. TBS are known for making top quality FPV products, so you would expect their venture into brushed FPV micro quads will be impressive? The only thing relay going for this TBS X-Racer frame is that its uses the Unify Pro VTX which is probably one of the best out there. But that is where it ends, its over $50 more than the fire 104 and uses all the same gear except the Vtx. If it where priced closer to the $100 mark and used an F3 flight controller, it would be so much better. It might look like a neat little miniquad thanks to its integrated PCB design (no messy wires) but unfortunately the X73 uses under powered motors and the PCB frame itself is quite heavy making for a very sluggish and unresponsive micro quad. 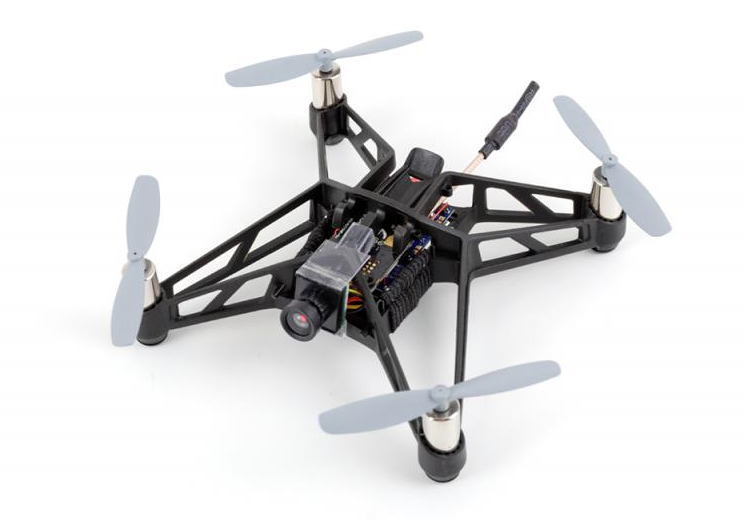 I have also been told by Eachine that they are no longer making this because its simply just not fun enough to fly. That said you can still pick one up from banggood, who are selling it at cost to get rid of them. Then you could investigate upgrading to some more powerful 8mm (0825) motors as used on QX90 and QX70 to give it some more power. Hope you found this article interesting, if you have any questions or comments just add them below. Also if you think I missed an RTF micro quad also let me know so I can get it added to the list!